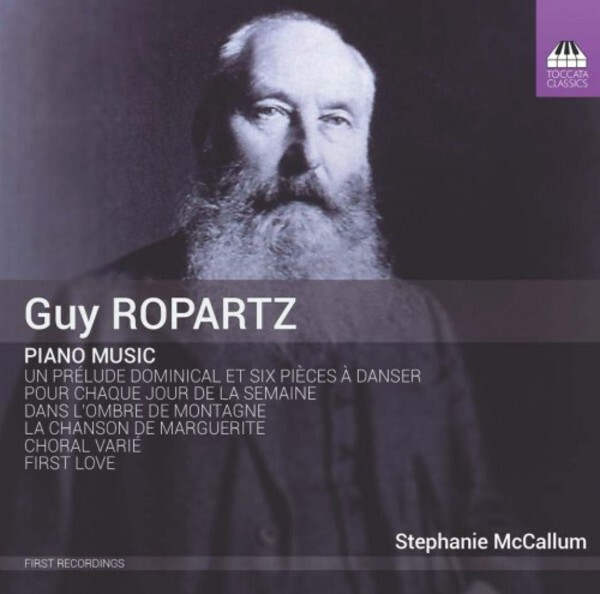 Guy Ropartz (1864–1955) was one of the unsung heroes of French music, often conducting the music of his contemporaries with his orchestra in Nancy. But Ropartz was a Breton, and his own music is impregnated with echoes of Breton folksong. That element combines with the dignified manner inherited from his teacher, César Franck, and the delicate shades of Debussyan Impressionism, to create an atmospheric and attractive style, instantly recognisable as French. This recording contains two large-scale suites, the first an evocation of the French mountains, the other the piano version of a frothy ballet written for Serge Lifar. They are completed by the Franckian Choral varié and two lighter pieces from early in Ropartz’s career. Stephanie McCallum has enjoyed an international career of over thirty years, appearing on over forty CDs. She is especially noted for her performances of virtuosic music of the 19th century, particularly the music of Liszt and Alkan, and also for her advocacy of demanding contemporary solo and ensemble scores. She is Associate Professor in piano at the Sydney Conservatorium of Music of the University of Sydney. Her 19 solo recordings include the complete Recueils de chants (TOCC0157 and 0158), which was received with universal praise: CD Review on BBC Radio 3 felt that the music was ‘really exquisitely played by Stephanie McCallum, who really “gets” the style’.